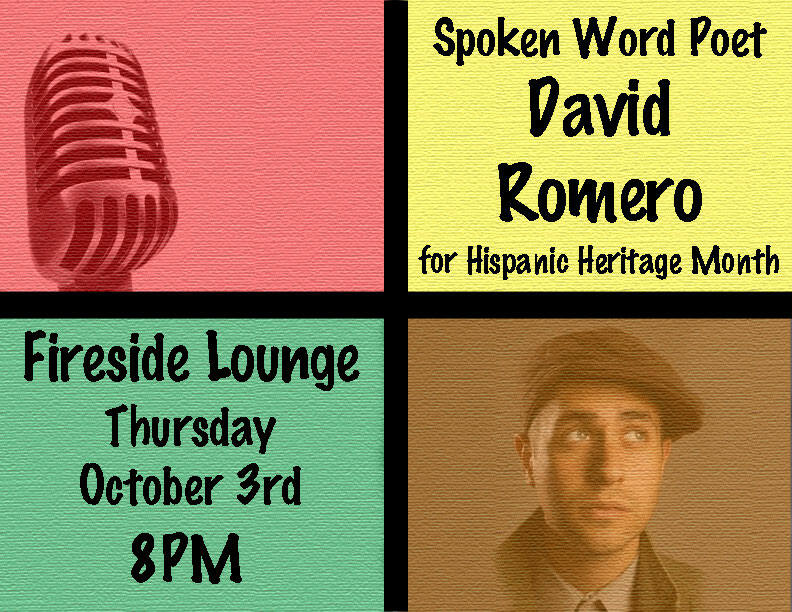 Where and when: IDX Fireside Lounge, 8 p.m.
Slam poet and spoken word artist David Romero will perform on campus in concert with Hispanic Heritage Month. BIO: David Romero lives in Diamond Bar, California and is a well-known artist. Romero has opened for winning and nominated artists at the Latin Grammys. His poetry has been published with poet laureates like Lawrence Ferlinghetti, Jack Hirschman and Alejandro Murguia. He has been featured alongside artists like Taalam Acey on HBO Def Poets. David Romero has also published two books featuring his poetry dealing with identity, family, social justice issues as well as suburban Latino culture. At his one man performance here at Champlain College, Romero will celebrate the histories, cultures and contributions of American Citizens whose ancestors came from Spain, Mexico, the Caribbean and Central and South America. Champlain College students will not only enjoy a unique entertainment experience, but also gain insight into the fastest growing marketing demographic and voting bloc in the United States.